House Speaker Paul Ryan of Wis. speaks during an end-of-the-year news conference on Capitol Hill in Washington, Thursday, Dec. 17, 2015, as the Congress moves toward passage of a $1.1 trillion omnibus spending bill. WASHINGTON (AP) — Republicans whipped more than $600 billion in compromise tax breaks for businesses, investors and families through the House on Thursday, as Congress tried capping 2015 with a flurry of accomplishments before the partisan collisions certain to dominate the coming election year. The House voted 318-109 to approve the measure, which is part of a bipartisan pact that includes a $1.1 trillion bill financing government agencies in 2016. 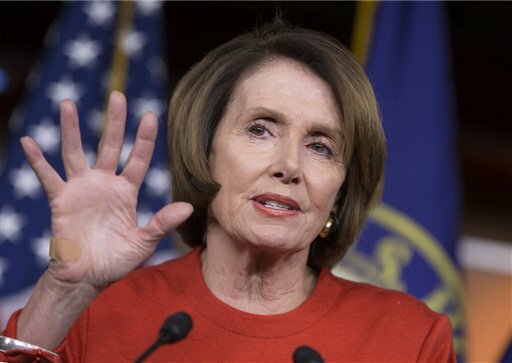 Some uncertainty arose Thursday over the separate spending measure as House Minority Leader Nancy Pelosi, D-Calif., suggested there might not be enough Democratic votes to push it through the chamber. Congressional leaders hope to ship both bills, a 2,200-page legislative bundle, to President Barack Obama on Friday for his promised signature and adjourn for the year. The tax bill would mostly renew scores of existing breaks that have lapsed or are about to, but its scope was impressive, with victories for both parties. Tax breaks for companies that buy equipment and invest in research would be made permanent, as would credits for millions of families with lower incomes, children or college students. "This is a pro-growth bill," said Rep. Kevin Brady, R-Texas, chairman of the tax-writing House Ways and Means Committee. "This permanent tax relief will make it easier for employers to plan ahead, hire new workers, grow their businesses." Most Democrats opposed the tax package, complaining that it would worsen federal deficits and make it harder to find money for the domestic programs they favor. They also said it was imbalanced, with 60 percent of its permanent reductions going to business and just 40 percent to families. "Middle-class wages are stagnant or in decline," said Rep. Rose DeLauro, D-Conn., an argument that Democrats are sure to press in the 2016 campaigns. "We need to do whatever we can to support working people." Tax credits for college expenses, child costs and lower-earning families are set to become permanent, as would cuts for companies that do research or buy equipment. The measure would make permanent or at least extend reductions for some charitable contributions, builders of energy-efficient homes, producers of Puerto Rican and Virgin Islands rum and owners of auto race tracks. Coupled with tax provisions that House leaders stuffed into the spending bill to attract votes, the legislation would cost the government an estimated $680 billion over the next decade. That would pump federal deficits over that period, already projected to total an astronomical $7 trillion, even higher. "It&apos;s a significant tax relief measure and of course you know how Republicans like to cut taxes," Senate Majority Leader Mitch McConnell, R-Ky., told The Associated Press. As if they needed more encouragement, Republicans said the tax bill would make revamping tax laws next year easier by clearing away those extensions now. GOP leaders hope to produce tax and health care overhaul measures next year, fully expecting vetoes from a Democratic president but savoring the campaign-season opportunity to fire up conservative voters. Though Pelosi opposed the tax measure, Democrats were divided over the overall budget deal. Senate Minority Leader Harry Reid, D-Nev., said the budget agreement was "a good compromise." The White House, in a letter expressing support, said the deal would "help to grow the economy and build middle-class economic security." Tucked into the two bills were provisions trimming some of the taxes that help pay for Obama&apos;s prized 2010 health care overhaul. The White House opposed the rollbacks, but Republicans and many Democrats savored them. A tax on medical devices would be suspended for two years, a levy on health insurers would stop for one year and, in a victory for unions, a tax on higher-cost insurance policies would be postponed two years until 2020. Democrats failed to block GOP language restricting federal reimbursements to insurers losing money on federal and state exchanges where people buy coverage. Many say that&apos;s helped destabilize some markets. Republicans won an end of the four-decade ban on U.S. crude oil exports. The industry said lifting that prohibition would create jobs and lower gasoline prices — outcomes that opponents said were flat-out wrong. In exchange, Democrats secured extensions of tax breaks for alternative power sources such as solar and wind energy. The tax bill also takes a shot at the Internal Revenue Service, which Republicans have not forgiven following its admission that it subjected conservative groups seeking tax-exempt status to unfairly tough investigations. The measure would make it easier for people to get information from the IRS about their cases and for groups to appeal agency decisions against them. AP Congressional Correspondent Erica Werner and Associated Press writers Stephen Ohlemacher, Andrew Taylor, Mary Clare Jalonick and Matthew Daly contributed to this report.